“If you want to live a hundred years, then buy a bike,” the saying goes. And, indeed, it is a simple, environmentally friendly and affordable to most people, the machine helps to move to closer apartment world, on the shore of a picturesque lake or a man-made green landscape of suburban area, helps to preserve good physical shape. 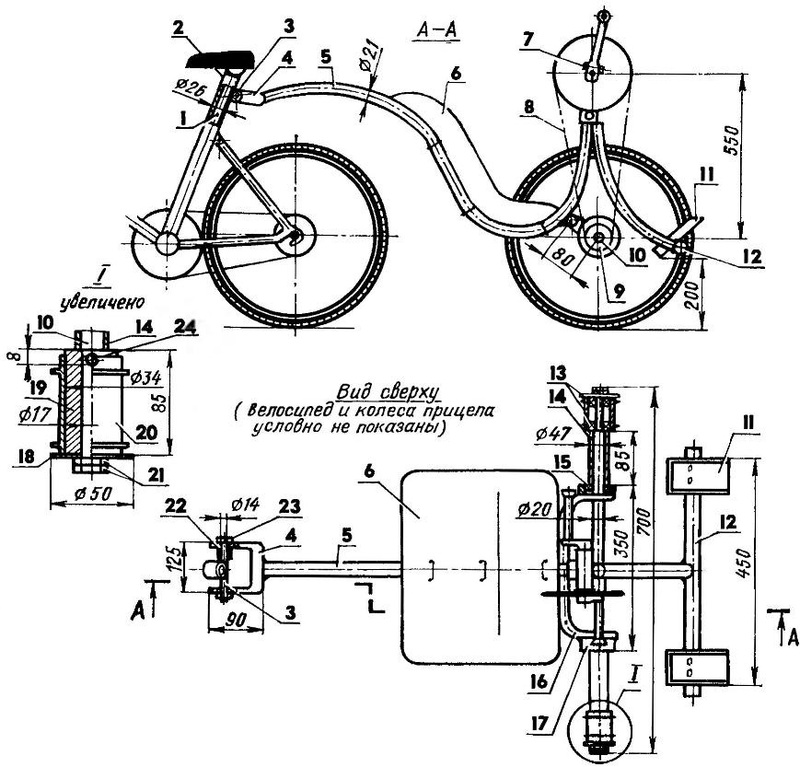 That’s probably why I run out of ideas and of innovators to improve the bike, which is confirmed by publications on this subject in the periodical literature. Based on it made even velomobiles, which has some elements of comfort, good stability. Recently heard on the radio that in India rickshaws will soon get a new car, it is designed for two passengers and is equipped with a multistage transmission. In its development, as reported, was attended by transport institutions in the US and China. My bike trailer with optional power drive — the design simpler, but it allows you to turn without any alterations normal bike in a double “twin-engine” recumbent. Trailer — two-wheeled. His wheels are mounted on a common shaft with a diameter of 20 mm, rotating in bearings 204, which is pressed into the cage, welded to the ends of the support arc hard suspension. The shaft ends are pre-machined to a diameter of 17 mm and they tapped M16. One wheel is mounted on two bearings 203 and the hub the other firmly planted on the shaft by a bushing. This connection with the inner side of the fixed diametrical pin and the outside of the preloaded nut and lock nut through the washer. The slots for the dowel pin on the hub cut a thin abrasive wheel, so as not to spoil it and, if necessary, to use the wheel in the bike. Between the wheel and suspension bearings on both sides on the shaft loosely fitting the metal spacer. The load-bearing element of the trailer drawbar a-frame-stand. So hard he named because light is bended as one of the half-inch steel pipe with a length of 2 m. Around the place where the frame goes into the rack, the load-bearing member is welded on the support arc. On the upper end of the strut is mounted bottom bracket with sprocket, cranks and handles (instead of pedals). The rack is welded cut a curved pipe with a cross support for the legs (pictured in the Intro depicts the initial version of the support made of the front fork and handlebar from the old bike). In the cavity of the carrier element (area of frame) installed the seat. Under it on the shaft in the plane of the upper sprocket fixed sprocket driven, they are both connected by chain. To the front end of the drawbar is welded to the plug (the photo of her yet), curved manually in the grip of half-inch pipe. Its tapered ends of the drilled holes with a diameter of 15 mm. To connect the trailer to the bike seldenifil loosely fitting ferrule — cut steel pipe with an inner diameter of 26 mm and a length equal to the “departure” of sudaderas on the frame. The cage is welded to the transverse pin, which connected the plug of the trailer: first introduced all the way into the clip one of her pen, then at the other end of the pin wearing restrictive tubular insert and the second feather of the plug, then screwed the nut. The passenger sits with his back to the direction of motion, puts his feet on the supports and arms rotates the connecting rod (also Vice versa! ), helping the driver. Because of the rigid connection manual drive wheel (track bike) hand cranks rotate on the move always. Every craftsman will work out what the trailer is easy to replace manual transmission foot, or install both at once. 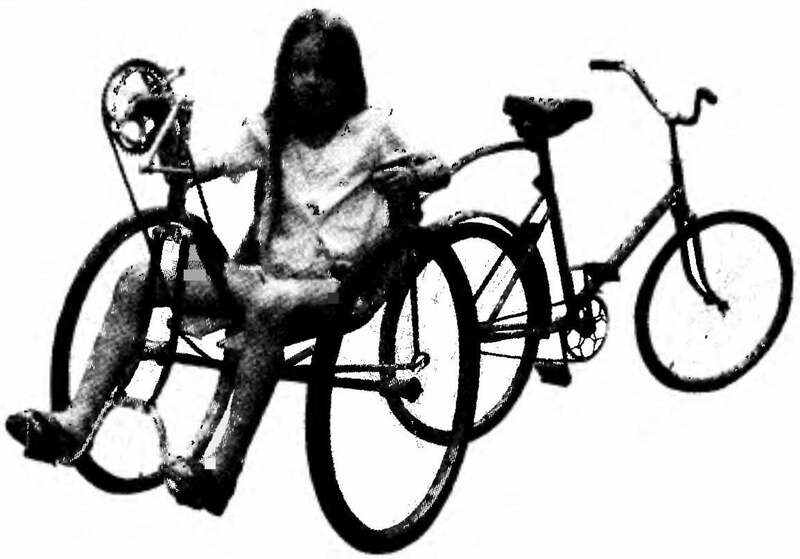 The slope of sudaderas allows small roll bike in the direction of rotation (with moderate riding, and designed this “tandem”), partly by balancing the centrifugal force. Additional stability is provided by the trailer wheels and ground passenger. The trailer can be used as a hand truck. Using a fork as a handle (it was introduced in the design), can be easily transported, for example, a bag of potatoes, placing it on the seat closer to the shaft. Usually the bike is five or six months of the year. In the autumn slush and cold of winter he’s standing (or hanging) without waiting for the new season. But the bike can be health benefits to operate all year round, although not necessarily, ride it. Equipping it with simple devices and support, you will receive a great exercise for the muscles not only arms and legs but also the back, and the press. On the bike trainer instead of steering set bottom bracket shell (without tubes of the frame). The bearings of the steering column previously removed and the front plug is fitted tightly clamping cone, which prevents its rotation. The left connecting rod of the regular BB node is replaced by a rod with an asterisk, connected chain from the top sprocket with the same number of teeth. At the ends of the shafts of the foot and hand carriage of nodes on one side using abrasive wheel cut additional end-to-end grooves (flats) in order that the connecting rods can be rotated 180° and secure with a wedge. Pedals hand cranks replaced the bushings, and the leg rods is provided with a homemade tulipani (see “modelist-Konstruktor” No. 5′ 2000), allowing not only push but also pull the pedals up. For reliable chain tensioning on the steering rod is wearing a retainer bushing. 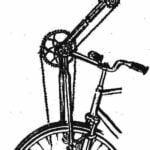 Its length and chain length manual drive depend on the type of bike and are determined locally. The links of the chain understand such sequence. Placing the chain on the jaws, separated by 4 — 5 mm, a punch diameter of 3 mm beat out the right axle, but not completely, and so she remained in the lower outer plate. Lightly pry off the top plate, rassadina chain and remove (or add) links. Connect the links in reverse order, hitting the hammer on the protruding axle until it is fully seated in the outer plate with the other hand. 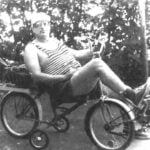 To trainer stood steadily on the floor, made front-support in the form of an isosceles triangle of half-inch steel pipe with a length of 1.5 m. the Ends of the tube flattened and bent, they drilled holes the diameter of the axle of the rear wheel. The rack is welded to the longitudinal emphasis of the segment of the same pipe. To the front fork under the crown bolt M6 attached to the foot support. On both end of the prop wearing rubber tubing. Brake pads from the hub of the rear wheel “roadman” is extracted for the possibility of reverse rotation. The simulator is equipped with a rear hand brake, rubber pad which is pressed against the rim to generate the required load on the pedals, that is, provides the desired “resistance alignment”. This is achieved by rotating and fixing the adjusting screw, which passes through a metal cable, mounted on one of the brake levers. As wear pads screw slightly tightened, restoring the load. If you are interested in radiomodule, there is a desire to learn to fly quadcopters DJI Phantom 4, to tips, please. Trainee, sitting in the saddle (it should be softer) and having got his feet under the bottom support on the front fork, slowly takes the trunk back down and returns to its original position, “shaking” thus the press. Rotating the hands and (or) feet of the respective arm and pedal, it is possible to successfully develop the muscles of the arms and (or) feet. If you rearrange the left cranks at 180°, making the arms and legs oscillatory motion, like the rower, you can train the large muscles of the back. The simulator is easy and reliable. To make it easy. And if to be smart, and upgrade that allows you to load other muscle groups.